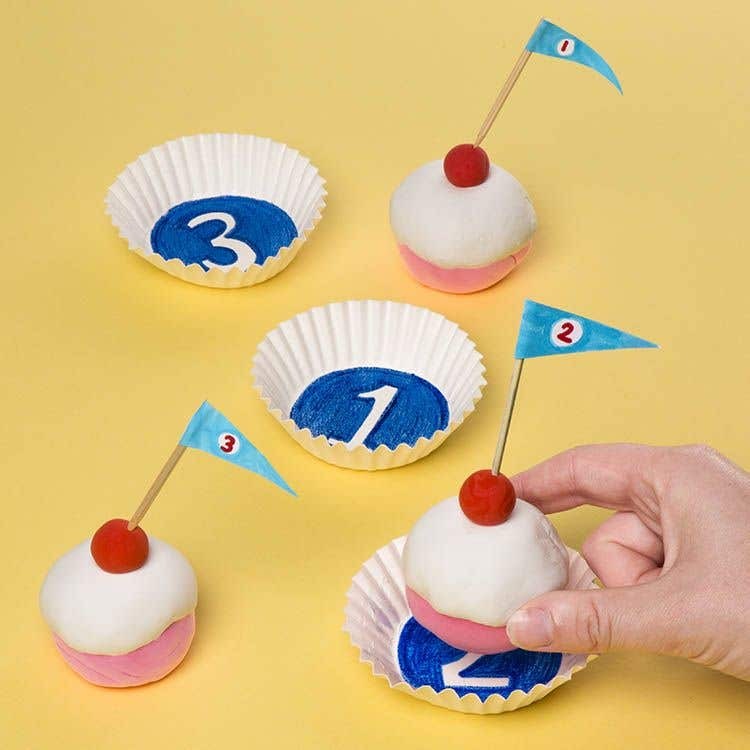 Learn how to recognise numbers with this modern twist on a game of ‘snap’ using clay cupcakes and cases! Take a plain cupcake case and place it on a flat surface. Draw a number on the inside circular panel using felt pen and colour in the background. Colour in the number in a contrasting colour. 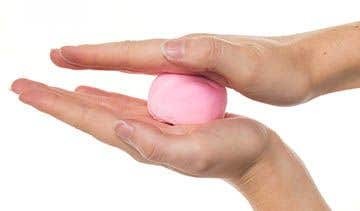 Take a pot of bright pink air dry clay and roll into a ball. Form it into a lightly tapered cupcake base that fits the cupcake case, as shown. Next, take a pot of white clay and half the amount inside. Roll into a ball, then flatten it out into a circular ‘pancake’. It should be around the same size as the pink cupcake base. If it’s not, trim a little around the edges with a plastic clay tool. Press the white pancake over the pink cupcake base, matching the centre to the centre of the base and pressing down, then adhering it to the base by gradually pressing your fingers outwards until it’s all secured. This creates the ‘icing’ layer, as shown. Don’t worry if the edges of the white layer are a little rippled, this adds to the effect. Next, take a little amount of red clay and roll into a ball for the cherry on top. Press the cherry centrally to the clay cake and leave the whole cake to dry. Cut a piece of white card 1cm x 2cm and cut a V into one end, as shown, to form a flag. 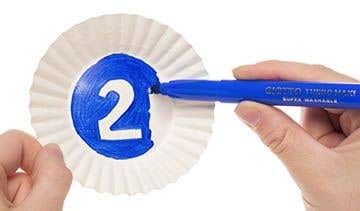 Draw a number onto the flag - the same number that’s on the cupcake case, so it matches up for the game. Colour in the background and colour in the number using a felt pen. Affix the non-V-shaped end to a cocktail stick or trimmed wooden skewer with a glue dot. 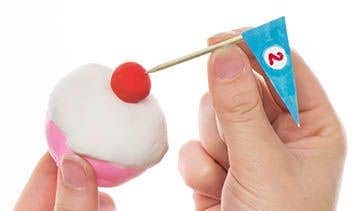 Finally, poke the stick into the centre of the cherry and through into the cupcake. Now, make repeat these steps, using a different number each time so you have enough to play the matching game! To play, separate all the cakes (with the flags in place) from their cases, and muddle up the cases. Children need to place the correct cupcake into the correct case. You can also then use it to create sums - adding the number on the case and the flag or multiplying them together for a more advanced activity. If you don’t have any cocktail sticks, cut a longer skewer to size.